Agnes Irwin (3/22): I was very proud of the way the girls came out and played today. We fought hard from the first draw until the very end. Our offense capitalized on some great looks and defensively Kate Nalevanko did a fantastic job in the second half on Hannah Keating. Liz Scott in her first varsity game tallied 7 draw controls and the first 2 goals of her career. Abby Lord did a great job offensively scoring 5 goals. Maggie Friel led the team in ground balls and had 3 goals and 3 assists. Overall, I was very pleased with our effort all over the field. Lower Merion (3/27): The girls came out a little slow today and even though it wasn’t our best performance, we came away with a win of 14-2. Maddi Little scored her first two career goals today! The scoring was very spread out with 9 players scoring, which is great to see. Maggie Stetson led the team in ground balls while Elsie Wagner, Maggie Friel and Lexi King all had 2 caused turnovers. Laney and Jules were great in cage with 2 saves for Laney and 3 for Jules. Marriots Ridge (3/29): We lost a tough game to Marriots Ridge, the state champs of Maryland, 17-7 on Saturday. They were a very tough fast team. Leading the team in ground balls was Abby Lord with 3. Sondra Dickey and Abby Lord both lead the team in scoring with 2 goals a piece. Unfortunately, we lost Eliza Hacke to an ACL tear during this game. Eliza had just caused a turnover and brought the ball down the field and had her first assist of the season. We are so sad for Eliza, she will be missed on the field. Century H.S. (3/29): After our loss to MR, the girls came together and played an outstanding game vs Century, who lost in the state championship to MR last year. We fought so hard, never giving up, even coming from a 6 gold deficit to eventually lose in OT by 1. Scotty Rose was on fire! She scored 6 goals and had 3 draw controls. Maggie Friel led in draw controls with 6! I was really proud of the girls and I know that even though we lost in OT, this was a winner for us. We will be well prepared for our hard Central League games this week. Upper Dublin (3/31): We beat UD 14-12 today. Liz Scott lead in draw controls with 6, 1 goal and 4 assist. Maggie Friel did a great job on defense and offense! She caused 3 turnovers and had 4 goals!. Maggie Stetson had 3 goals, and Abby Lord 2. Shannon Sweeney played great defense in the 2nd half, holding one of Upper Dublin’s top players to only 1 goal. Both goalies played well today with 7 saves total. Springfield (4/1): Today we lost another tough game to Springfield. Although we came back from a 5 goal deficit, we ended up losing 13-9. In the midfield, Scottie Growney came up big on the draw with 6 and 2 goals. While Maggie Stetson also was aggressive off the circle and got 4 draws controls. On the offensive end, Rilee Scott easily found the net and scored 3 big goals for us. On the defensive end, Laney Stenson had 5 saves which kept us in the game. Our defensive unit did a great job crashing in the 8 and taking away many shooting opportunities for the Springfield attack. I am excited to see this team bounce back on Thursday! Go STOGA! Sticks up, Heads up!!! Radnor(4/8): The girls played really hard today. We had numerous opportunities to come away with the win, but missed shots at the end of the game came into play. Overall as a team we had 5 caused turnovers, most of which were in the last 5 minutes of the game. Maggie Friel led the team in both draw controls (5) and goals (3). The second half was a total team effort and I was really proud of the effort on the field. Marple Newtown (4/10): Tonight was a fun win over Marple for the girls, 13-1. Abby Lord led the team in ground balls with 3, Scottie Growney had 5 draw controls and Maggie Friel hand 4. Scoring for Stoga was Abby with 4 goals 1 assist, Lexy King 3 goals 1 assist, Maggie Friel 2 goals 2 assists, Rilee Scott 1 goal, Kate Nalevanko 2 goals and Maddi Little 1 goal. Downingtown East (4/12): WOW! What a game!!! The girls came out today on FIRE!!!! We had total control of the game in the first half and led 9-3. The second half got a little scary when we allowed Downingtownto come within 2 goals but we were able to hold them off for a huge non-league win. Abby Lord had 5 draw controls while Scottie Growney had 4. Monica Borzillo and Scottie Growney both had 3 goals to lead the team in scoring. Lexy King led the team with 3 caused turnovers. Harriton (4/3): JV is now 5-0 and had another great win against Harriton on Thursday. We won 16-4. We won 11 draw controls and had 7 caused turnovers. We also had 12 different players score. Hannah Ashton and Maggie Gladden led the team with two goals and 1 assist each. In the midfield, Madie French, Lauren Burns and Maddi Little each got 2 draw controls. Way to go Stoga!! Radnor (4/8): JVA had a close game and tied Radnor 7-7. Anne and Kara were huge assets in cage. Together they had 10 saves and really kept us in the game. Maddie Omrod, Madie French, Maddi Little, Lauren Burns, Maggie Gladden , and Hannah Ashton (2) all scored. Paige Loose had two assists and Madie French had one. The defense caused 8 turnovers and came up with a huge stop with 7 seconds left in the game to keep the game at a tie! Way to go defense! Marple Newtown (4/10): JVA had another great win against Marple Newtown. We won 13-1. Anne had a great game in goal allowing only one goal. The team had a great game all over the field. We won 11 of 14 draw controls. As a team we caused 10 turnovers and 7 of our 13 goals were assisted. We also had ten different players score. All around great team win!!! Strath Haven (4/22): Stoga had a close game with Strath Haven on Tuesday. We tied 11-11. We dominated in the midfield and we were able to get 16 draw controls. Hannah Ashton led the team in draw controls with 8. We had 7 different people score Lilly Shaner, Grace Eaton, Chrissy Walton, Paige Loose, Madie French (2), Natalie Dahl (2), and Hannah Ashton (3). 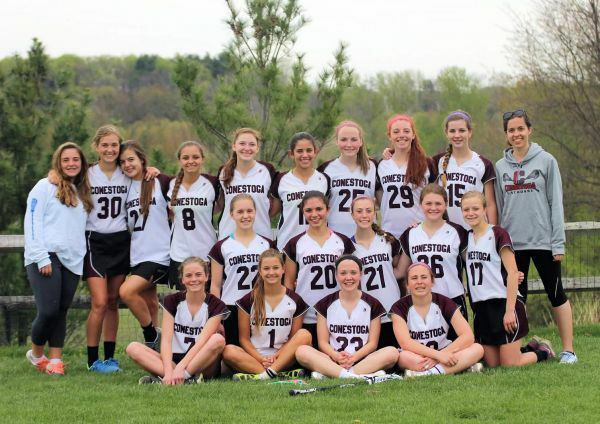 Haverford (4/24): On Thursday, we had an awesome team win against Haverford. We won 16-4. We won 13 draw controls in the midfield. Madie French had a stand out game with 3 goals, 1 assist, 2 draw controls and 2 caused turnovers. Michaela Bailey led the team on defense with 5 caused turnovers. 9 players scored for us; Hannah Ashton, Meredith Ross, Natalie Dahl, Maddi Little, Chrissy Walton (2), Maddie Omrod (2), Maggie Gladden (2), Lauren Burns (3), and Madie French (3). Ridley (4/29): Although the weather was not great, Stoga pulled out a great win against Ridley. We played great as a team and we were able to win 13-3. Grace Eaton led the attack with 5 points, 3 goals and 2 assists. Meredith Ross also had a great game with 1 goal, 1 assist, and 2 draw controls. Hannah led the team with 4 draw controls. Scoring for Stoga included Chrissy, Natalie, Meredith, Ilana (2), Paige (2), Hannah (3), and Grace (3). Great job Stoga!! Garnet Valley (5/1): Thursday, the JV had a fantastic game against Garnet Valley . They came out strong from the start with a goal from Micaela and never looked back. We won 12-5. We dominated all over the field, winning 11 draw controls. We caused Garnet Valley to turn the ball over 8 times. 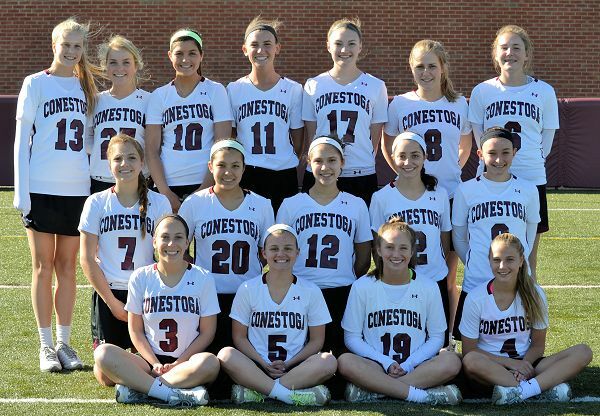 Scoring for Stoga included Michaela, Paige, Meredith, Madie French (2), Chrissy Walton (2), Lilly (2), and Hannah (3). Awesome job Stoga!! Upper Darby (5/2): Friday, we beat Upper Darby 14-0!!! Anne played great in goal with her first shut out!! Way to go Anne! Chrissy Walton had a great game on attack with 3 goals and 1 assist. Scoring for Stoga included Grace, Meredith, Lilly, Ilana, Lauren, Alexia, Jess, Madie French (2), Maddie Omrod (2), and Chrissy (3). We also had 9 of our 14 goals assisted. Our assists were by Ilana, Chrissy, Micaela, Meredith, Lauren (2), and Jess (3). Great team win Stoga! Unionville (3/28): After starting the season with a disjointed practice schedule due to all of the rain and snow, the girls played well in their first high school game! Katie Sedlak scored a quick goal to start the game which she later followed up with two others. Hope Skelly contributed two assists to the offensive play as well. Defensively, Lindsay Erickson led the team with both her tight midfield defense as well as her defense around the arc. In goal, Abby Deeter kept us in the game with 6 saves. Penncrest (3/31): The JVB girls came out on Monday to beat Penncrest 18-2 after a last minute change of venue to Teamer field! Hope Skelly led the way with 3 goals and 3 assists. Following close behind were Lindsay Erickson, Sammi Aufiero, and Jordan Metzbower with 2 goals a piece. Katie Sedlak had the most assists with a total of four. This game provided a great opportunity for the girls to practice skills like plays, playing with their non-dominant hand, and doubling in game situations. All in all, it was a great first win. 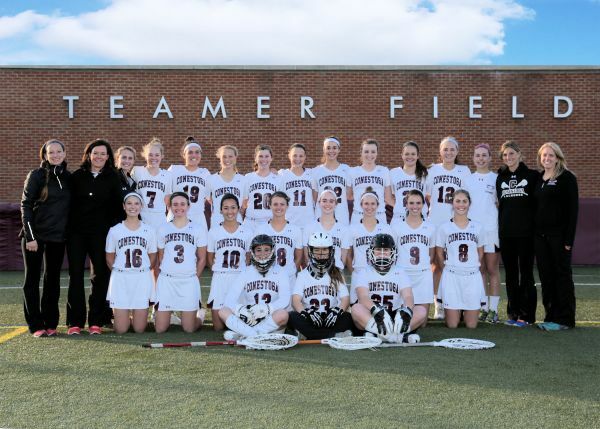 Radnor (4/3): The girls started a little slow today but ended up coming from behind to eventually win 7-6 in the last two minutes in an intense nail biter of a game! Kirsten Dirks provided a jump start on both the defensive end and on attack scoring the first goal of the game for ‘Stoga. After being down 5-6 with 1:39 left in the game, Morgan Littlewood came up with the draw to eventually tie up the game 6-6. In the final forty seconds of the game, Sara Flatt came up with the draw to assist Emma Scudder in scoring the game winning goal! In the second half, the defense played very well continually pressing Radnor’s offense and forcing turnovers. Abby Deeter kept the game close coming up with 6 big saves. Overall, it was a great win for the JVB team!! Tuesday (4/8) @ Garnet Valley (9-7 Loss): The girls initially had a hard time trying to defending against Garnet Valley’s offense. But after being down 8-2 at half, the girls got back on track scoring five consecutive goals to bring the game within one point. Despite big saves from Abby in cage, we ran out of time to overcome our first half deficit. Bright moments of the game were the great teamwork between Morgan Littlewood at center and Sara Flatt on the circle. Sara had three consecutive draw controls and Morgan contributed two goals. In addition, Georgia McLoughlin scored her first goal of her high school career. Friday (4/11) @ Unionville (9-8 Win! ): Unlike some of the previous games, the girls were out for a win from the beginning of this rematch against Unionville! Jordan Metzbower scored her first goal of the season with Katie Sedlak following that up with two of her own to bring Stoga to a quick 3-0 lead. The girls kept this momentum up throughout the first half with Sara Flatt, Kirsten Dirks, and Lindsay Erickson leading the team with 4 ground balls a piece. In the second half, despite letting up on their intensity a bit, Courtney Spencer came up with some big defensive plays late in the game to help her teammates hold the 9-8 lead for the win. In addition, Hope Skelly topped the scoring board with 3 goals and 2 assists. Tuesday (4/22) vs. Coatesville (16-5 Win! ): This game marked the girls’ first home game at Wilson Park and they came out with a 16-5 win! Despite playing down at the beginning of the game, the girls eventually shook off any remaining spring break lethargy to come back and dominate the offensive end of the field. Katie Sedlak led the team in scoring with four goals on the day. Jordan Metzbower followed closely behind with three. In the midfield, Morgan Littlewood contributed four assists and two of her own goals. Many of the defenders also contributed to the goal total with Courtney Spencer scoring twice and Sammi Aufiero scoring once. In addition, Lindsay Erickson ended the game with three draw controls and two interceptions. Wednesday (4/23) vs. Radnor (8-9 Loss): Knowing this rematch against Radnor would be tough, the girls came out strong and led the game at half. In the second half, Radnor started to come back and tied the game 8-8 with a minute left. Unfortunately, Radnor scored again to make it 8-9 and the time ran out before the girls could retaliate. It was a tough loss but overall the girls played very well. Leading the scoring effort was Katie Sedlak with 3 goals and 1 assist. Kirsten Dirks also added 2 goals and an assist of her own to the total. In addition, Morgan Littlewood and Sammi Aufiero had 4 ground balls each which benefitted us in the midfield. In the net, Abby Deeter came up with 8 big saves which helped keep the game so close. Friday (4/25) @ WC East (14-5 Win! ): Rebounding from a tough loss to Radnor on Wednesday, the girls were ready for a win against West Chester East. Despite some silly calls which kept the game within one goal initially, the girls got back in sync and took the score from 3-3 to 7-3 before ending the first half. In the second half, the girls kept up the momentum and ended up letting in only two more goals to make the final score 14-5. Crucial to this momentum was Morgan Littlewood at center dominating the draws, ending with 11 draw controls, 4 goals, and 3 assists. Emma Scudder also provided a spark on attack with 3 goals and 1 assist of her own. Also contributing to the goal total was Hope Skelly with 2 goals and 3 assists, Addison Wallace with 2 goals, Georgia McLoughlin with 2, and Kirsten Dirks with 1. Abby Deeter ended the game in cage with 11 saves. Monday (4/28) vs. Garnet Valley (7-10 Loss): Despite a surge in the second half, the girls lost 7-10 to a Garnet Valley team which was one of the best teams we have played this season. After being down 2-8 at half, the girls came back with 2 quick goals to start the second half. In addition, the team only allowed Garnet Valley 2 more goals in the second half which was much better than the 8 allowed in the first half. The scoring was spread out which great to see with Morgan Littlewood scoring twice and Katie Sedlak , Emma Scudder, Hope Skelly, Sara Flatt , and Addison Wallace each scoring once. Mary Kate Boccella played well in the second half getting four ground balls while Aubrey Taicher contributed 2 interceptions while re-defending in our offensive end. Around the circle, Hope Skelly came up with 4 consecutive draw controls. Friday (5/2) @ Coatesville (14-3 Win! ): The girls ended the week with a big win against Coatesville on Friday! Once again, the scoring was fairly spread out with nine different girls scoring. Hope Skelly and Katie Sedlak led the scoring with 2 goals and 3 assists for Hope and 3 goals and 2 assists for Katie. In addition, Morgan Littlewood and Courtney Spencer scored twice while Emma Scudder, Lindsay Erickson, and Jordan Metzbower all scored once. At center, Morgan Littlewood had an impressive 12 draw controls while Lindsay Erickson contributed 4 ground balls in the midfield. The game ended with a quick goal from Georgia McLoughlin with 2 second left to bring her goal total to 2 for the day.